Carly (Laura Wright) joined Michael (Chad Duell) on the terrace of The Metro Court and he told her that Nelle (Chloe Lanier) wrote him a letter from Pentonville. Carly thought Michael should throw the letter from Nelle away and avoid any future contact with the sociopath. Nina (Michelle Stafford) told Maxie (Kirsten Storms) that the pendant was Madeline’s (Donna Mills) way of trying to tell her that her (Nina) baby was alive out there somewhere. Nina reminded Maxie that she was told she miscarried but that could be a lie. Valentin (James Patrick Stuart) called Curtis (Donnell Turner) for an update on the search for Nina’s daughter. Jason (Steve Burton) asked Sonny if the worst case scenario happened and the gun and body were discovered in the foundation of Charlie’s how did it could tie back to Corinthos. Sonny replied that although Sculli gave him the gun so the weapon couldn’t be tied back to him, Sonny wasn’t wearing gloves when he fired it so his fingerprints would be found on the weapon. Meanwhile, Mike (Max Gail) wondered down into the basement of Charlie’s Pub. Wrench in hand, he repeatedly hit the gas pipe. A disorientated Mike was surprised to see Kristina (Lexi Ainsworth) at the pub. Curtis met with Valentin at the bar of The Metro Court and filled him in on his (Curtis) talk with attorney Carter Buckley, which confirmed Madeline was telling the truth about Nina’s daughter surviving. Valentin told Curtis that Madeline recently died of a heart attack. Maxie reminded Nina that the heart pendant in Annie was part of a con. She suggested that she and Nina go out for drinks and a movie to get Nina’s mind off things. Brad (Parry Shen) saw Carly and Michael but tried to avoid. But they spotted he and Wiley at The Mtero Court. After Carly commented how much Wiley looked like Michael as a baby, Michael told Brad about Nelle’s letter and how she mentioned Brad and Lucas. In the letter, Nelle wrote she hoped being around Brad and Lucas’ baby Wiley gave Michael some peace. After Brad left, Michael gave Carly the letter to read. Carly was angry Nelle wrote that she forgave Michael. She was furious that Nelle was using a mind trip on Michael for his guilt over Jonah’s death. Carly reminded her son that the letter was classic Nelle and urged Michael not to fall for it. Kristina called her father and told him about Mike being at Charlie’s. She said she and her grandfather would wait for Sonny to arrive to pick Mike up. Kristina noticed the wrench Mike had. Julian smelled gas and after going down in the basement and verifying the leak, he ordered everyone out of the pub. Once the patrons were safely evacuated, Julian was told by the fireman that the main gas shut off val had been tempered with indicating someone planned to blow Charlie’s Pub sky high. Kristina told her grandfather that she had to check on something and rushed back inside Charlie’s Pub looking for the wrench. She found it but tripped on a fallen chair, bumping her head and knocking herself unconscious. Curtis told Valentin that his partner Sam’s (Kelly Monaco) computer expert The Jackal was able to uncover wire transfers to the nurse and doctor Madeline hired to care for Nina. After Curtis left, Nina attempted to return her wedding and engagement rings to Valentin, but he wanted her to keep them vowing he’d love her divorce or not until the day he died. When he learned Kristina had gone back inside the pub, Jason rushed in to carry her out. Meanwhile in the lot across from Charlie’s Pub, Mike and Sonny heard an explosion. Mike (Max Gail) panicked that Kristina (Lexi Ainsworth) had gone back inside the pub when he told her not to. Meanwhile, Kristina was unconscious on the floor of Charlie’s. Drew (Billy Miller) lamented to Sam (Kelly Monaco) that he finally was able to make up to his son for all the years they missed and now Oscar (Garren Stitt) was going to be taken away from him. Sam encouraged Drew to focus on the good times and he and Kim would decide together when to tell Oscar the truth about his condition. They were interrupted by Alexis’ (Nancy Grahan) arrival. Jason (Steve Burton) scooped Kristina up in his arms. But before they left the pub, she told him to get the wrench. Mike shouted his granddaughter’s name as he and Sonny heard an explosion from the pub. Fortunately, Jason appeared shortly thereafter carrying Kristina. Once they were alone, Jason urged Mike to stay calm and not say a word. Sam and Alexis discussed Kristina but were interrupted when Julian called Alexis to tell her about the explosion. Franco (Roger Hogwarth) told Elizabeth (Rebecca Herbst) about Aiden, Cameron (Will Lipton) and the Princess Calinda of Everwood pencils situation. Franco and Elizabeth discussed co-parenting of Liz’s boys. Franco assured Elizabeth that he wanted a home with her and her three boys. Chase (Josh Swickward) questioned Julian (William deVry) about the explosion at Charlie’s Pub. Drew came to The Metro Court and shared a drink with Margaux (Elizabeth Hendrikson), who was drinking to her father who went missing years ago. Is Margaux’s father the body in Charlie’s Pub? Sam and Alexis arrived at the hospital where they learned that Kristina had a slight concussion. When her mother asked why she ran back into the pub, Kristina lied that she went back for her phone. In the hallway, Jason told Sonny that Mike started the gas leak with a wrench, which Kristina alerted him about and he (Jason) was able to retrieve it and put it in his car. After the fire department investigated, Chase was informed that the gas explosion was deliberate; Charlie’s Pub was now a crime scene. Sonny thanks Jason and Kristina for what they did for Mike. Sam also thanked Jason for saving Kristina’s life and commented how she wished everyone could be so lucky. It was obvious (but not to Jason because he didn’t know the truth) that Sam was referring to Oscar. Chase went into the basement of the pub and found a skull buried beneath the debris. Robert (Tristan Rogers) came to Anna’s (Finola Hughes) house to talk about Cassandra (Jessica Tuck). They were interrupted by Finn (Michael Easton) who was looking for his lost sock. Anna was surprise when Robin (Kimberly McCullough) showed up at the door. She was on her way back from a medical conference in Vienna and had to check to see whether her mother was alright. 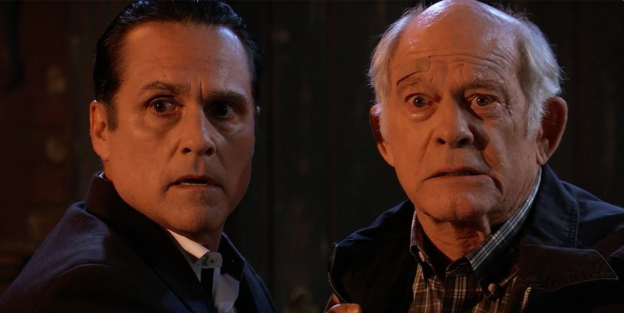 Sonny (Maurice Benard) told Carly he wondered why Julian (William deVry) hadn’t turned Mike (Max Gail) in but realized Jerome would come to collect soon. Cameron (Will Lipton) continued to display teen angst and rudeness towards Franco (Roger Hogwarth). Elizabeth (Rebecca Herbst) suggested that Cameron invite Oscar (Garren Stitt) over after school to study. But Cameron preferred to spend his grounding in solitude. 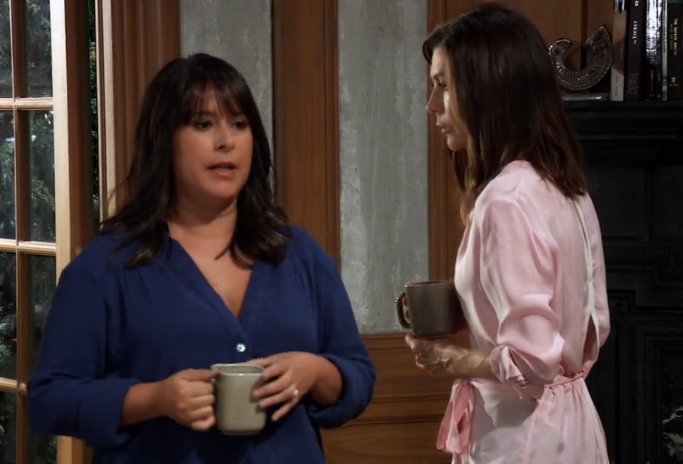 Kim arrived and after Franco left, Elizabeth told Dr. Nero that as she (Liz) and Franco don’t keep secrets from each other, if Franco asked a direct question about Oscar, she’d have to tell him. Oscar told Drew (Billy Miller) about an astroid that was coming towards Earth next year and suggested a father/son trip to Tanzania to see if as it would be a great new story. With Ava (Maura West) present, Chase (Josh Swickard) questioned Julian about the explosion at the pub and told him that he found a skeleton in the foundation of the basement. Julian reminded Detective Chase he was planning an expansion and wouldn’t have done so if he’d known there was a body in the basement. Mike was still feeling guilty about what he had done and told Sonny and Carly (Laura Wright) it would have been better if he had gotten blown to smithereens. Sonny told his father to never say they’d be better off without him. Mike the asked to look at the care facility brochures. He assured Sonny and Carly that he would be happy as long as he did right by his family. Anna asked Robin whether she forgave her. Robin realized that it was her mother’s secret to keep and there was no right time. Cameron let it slip to Oscar that he kissed Josslyn (Eden McCoy). The teens started fighting but soon made up. At the hospital, Franco asked Drew how he was able to have such a good relationship with Oscar. Robin commented that she believed there was hope for Peter and Maxie (Kirsten Storms) and Peter and Anna. Franco told Drew he’s there if Cain ever wanted to talk. Finn and Chase had a cup of coffee together as they continued their brotherly bonding. Julian told Ava that whoever bones they found he’d hope they get a proper burial and the mystery of how they got there stayed buried with them. Franco witnessed a hug between Drew and Elizabeth. Julian arrived at Sonny’s and told Corinthos that he knew why he (Sonny) pushed to buy the pub; he (Sonny) wanted what was buried underneath. Maxie (Kirsten Storms) brought James to Anna’s (Finola Hughes) to visit with Robin (Kimberly McCullough). She asked Robin how she (Robin) felt when she learned Peter (Wes Ramsey) was her brother. Meanwhile, Lulu (Emme Rylan) met with Peter (Wes Ramsey) at The Metro Court. He told her that he wanted her to write the story about the 25th Anniversary of the Ryan Chamberlain murders. Although reluctant at first, Lulu agreed. 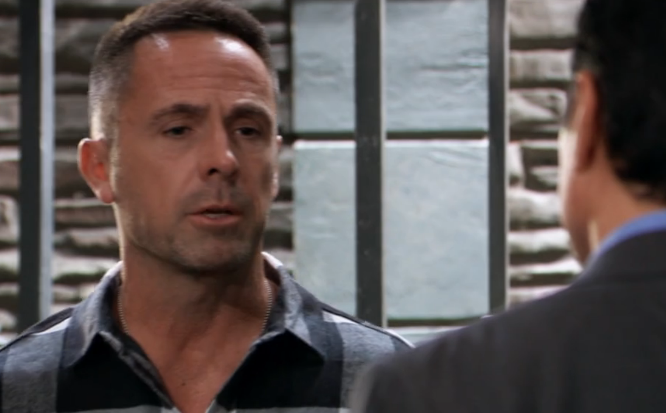 Julian (William deVry) came to see Sonny (Maurice Benard) and told Corinthos and Jason (Steve Burton) about the police uncovering the body in the basement and also about hiring Kristina as his bartender. After Julian left, Jason and Sonny discussed the situation. Meanwhile, Margaux (Elizabeth Hendrickson) and Jordan (now being played by Briana Henry) reviewed the history of Charlie Delaney and the pub. Ryan (Jon Lindstrom) practiced pretending to be Kevin and did research on his brother, including taking a phone call from Laura (Genie Francis). At Charlie’s Pub, Kristina fixed drinks which Sam (Kelly Monaco) tested. Sam asked her sister whether Kristina thought working at Charlie’s was a right fit. After Robin left, Anna and Maxie talked about Peter. Maxie told Anna how Finn was the one who saved Peter from the stable fire. Robin approached Peter at The Metro Court and told him how difficult she knew having Faison as a father. She asked him whether he planned to pick up where Faison left off…would he be a threat to her children? Peter assured he would never do anything to hurt her children and only wanted to make a new life for himself in Port Charles, but didn’t know how Anna would fit into that life. Robin talked about Emma and Noah and called them her miracles. She told Peter that Emma asked about him and she said she (Robin) was unsure whether he could be Emma’s uncle. Peter hoped to earn that honor one day. Maxie understood the hard choice and ramifications Anna faced by giving Peter up and assured her godmother she couldn’t be angry with her. Lulu came to see Ryan (who she thought was Kevin) and told him about the article on Ryan. “Kevin” agreed the piece was better in her hands and get the coverage Ryan deserved. Sam told Julian that she supported Kristina working at the pub. Sonny told Jason the murder has been hanging over his head after since Sculli gave him that job so if it finally came to light, he wasn’t running. Robin told Anna she wasn’t sure if she could develop a relationship with Peter. Meanwhile, Maxie and Peter ended up alone on the elevator at The Metro Court. Sonny vowed that nothing could get him to run away from his family. Drew (Billy Miller) told Curtis (Donnell Turner) that Monica was planning a surprise birthday party for him (Drew). Meanwhile at the Quartermaine house, Kim (Tamara Braun) helped Monica set up for the party. Curtis met with Valentin (James Patrick Stuart) and commented that he was aware Cassadine’s urgency in finding Nina’s (Michelle Stafford) daughter was because he (Valentin) wanted to be the one to deliver her daughter to her. Maxie (Kirsten Storms) complained that The Metro Court needed to add more elevators to handle the overload when she and Peter (Wes Ramsey) got stuck in the elevator. Maxie called Olivia and was told that the elevator was shut down while the repairmen men worked on it, which could take up to an hour. This was not happy news for Peter, who had a panic attack and became overheated. He took off his shirt. Maxie suggested breathing exercises to get him to calm down. Sam (Kelly Monaco) admitted to Kim that Drew told her about Oscar’s (Garren Stitt) prognosis. Kim later reminded Drew that the more people he told the greater chance for Oscar to find out about his condition. When she noticed a man watching her and told Curtis, Ashford grabbed the man and both learned he was a bodyguard hired by Valentin. Valentin told her that Cassandra Pierce (Jessica Tuck) was loose so he hired the bodyguard to protect her. He also wanted her to move back into Wyndermere but Nina refused and said that if Cassandra came near her she would be the one to have to watch her back. When Oscar arrived at the Quartermaine mansion, Sam noticed the bruises on his hand and realized he’d been in a fight. Maxie and Peter played ‘Would You Rather’ to pass the time while waiting for the elevator to be fixed. When it re-started and the door opened, Maxie and a shirtless Peter came out right in front of Nina, who commented she didn’t even want to know. Curtis told Valentin that his forensic accountant was able to trace the wire transfers back to a single mother with a daughter the same age as Nina’s daughter would be. Margaux (Elizabeth Hendrickson) and Jordan (Briana Henry) uncovered Sonny’s connection to Frank Smith’s organization. 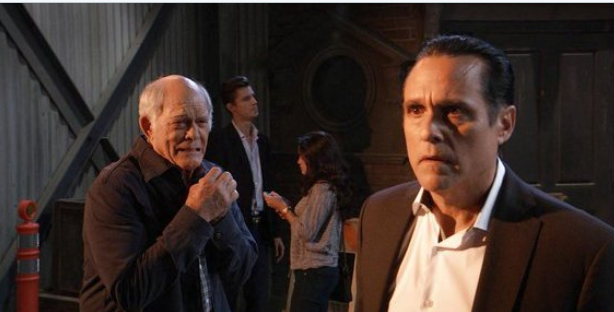 Mike (Max Gail) overheard Carly (Laura Wright) and Sonny (Maurice Benard) discussing him and his Alzheimer. He decided to go into a facility to spare his family more pain. Margaux and Jordan arrived at Sonny’s house, not to question Corinthos but his father.